The first example the came to my attention as I could see how I could have used it in our recent game, was Neon Text @ spoono.com. 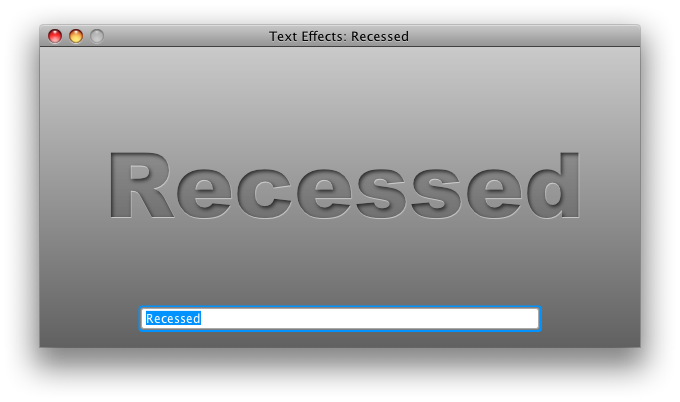 This is achieved in JavaFX by applying multiple innershadow and dropshadow effects to the text. Here is the complete code for the test application above. 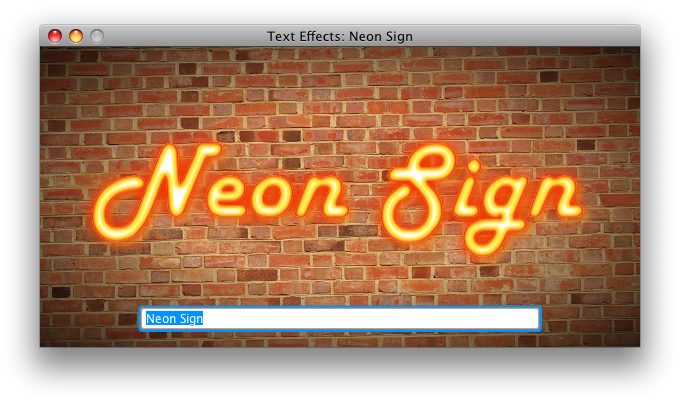 title: "Text Effects: Neon Sign"
This one was based on the Tutsplus.com article Icey Styles in Photoshop but as we do not have the Bevel and Emboss effect that photoshop has yet I had do my best to simulate it with inner and drop shadows. 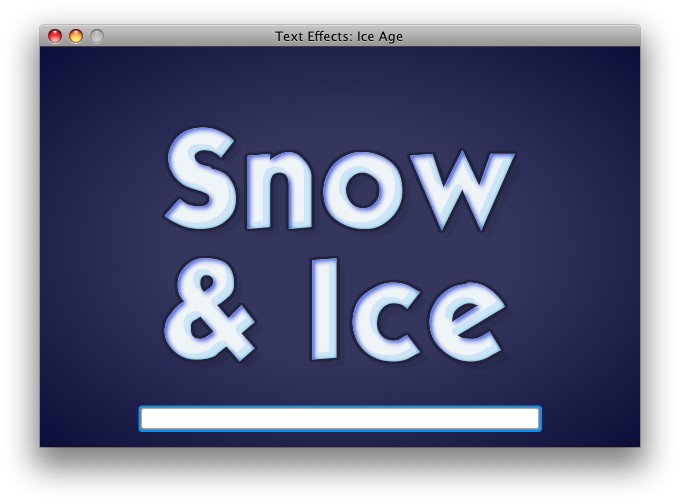 title: "Text Effects: Snow & Ice"
After playing with a couple from tutorials I thought I would have a go at one my self. This is a version of the classic web recessed text effect. 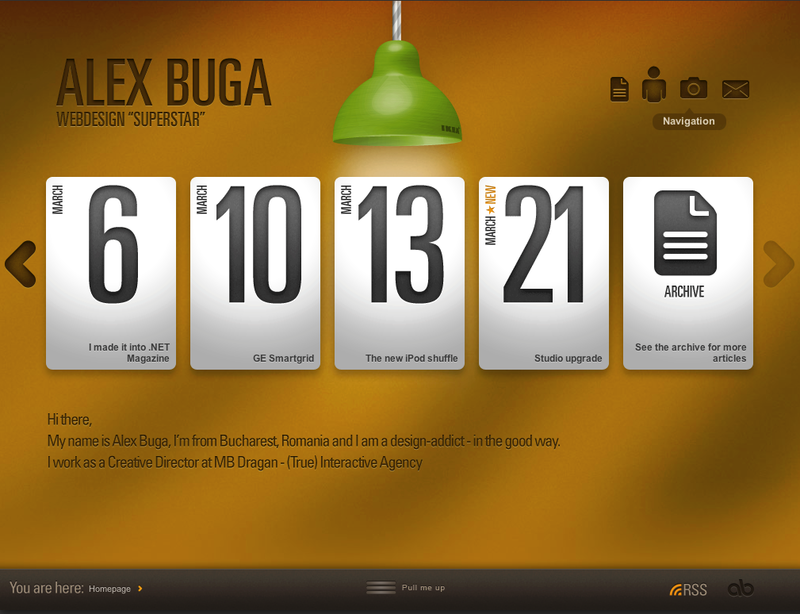 The designer Alex Buga used this technique to great effect on his website. 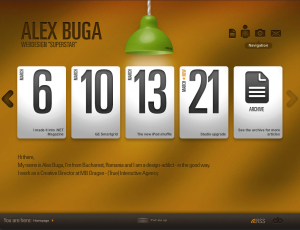 Unfortunately its down for redesign at the moment but for those who missed it here is a snap shot. Here is the code for this sample. Its much simpler than the first two as it only uses two effects and a gradient fill on the text. It could be applied to any color just by changing the text fill gradient to be darker version of the background it is sitting on. One last little example for you, this one is going for a chrome look. This only uses a single simple reflection effect most of it is done with a gradient fill and gradient stroke. 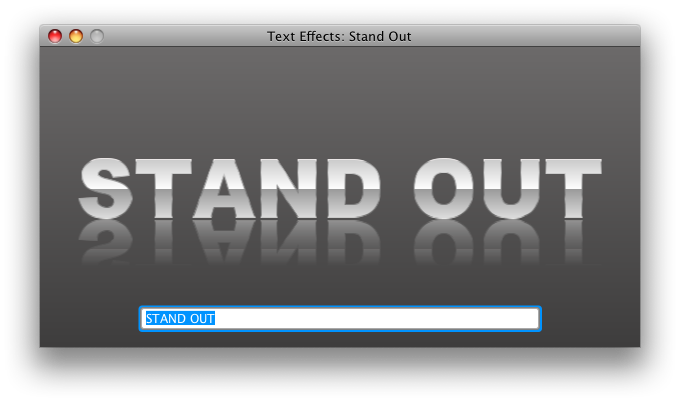 title: "Text Effects: Stand Out"
I hope you have enjoyed these 🙂 Have a go see what you can create your self it would be great to be able to put together a “50 Stunning JavaFX Text Effect Tutorials” blog. Wow, nice work. When I see this I immediately think “multi-look text component.” How do you think you would pull this out into a reusable API so we could just plug in the look we wanted? I started merging all the demos onto one file but decided it was simpler to follow separated. The backgrounds are separate think to solve as that depends on the use or the text. The rest is simple to extract and make generic as its only 5 settings: effect,fill, stroke, strokeWidth and font. Recessed demo doesn’t seem to work. No output when text is typed in the textfield. The rest of the demos are working fine though. I was wondering if that will crop up as I saw same issue on my wife’s PC laptop. But asked a few other people to try it and it worked fine for them. My guess its a issue finding “Arial Black” font. Does Stand Out one work for you which uses same font? Stand Out works for me but Recessed does not display any text (Win XP, IE). when running under Windows 7, the Recessed demo does not work. However, by removing the following section from the code, the text will appear (so I doubt that font is the issue). Is there a problem when Blend and LinearGradient are used together under Windows ? All the demos work fine using NetBeans except for Recessed. The problem with Recessed demo is fixed in the next JavaFX release. It was likely caused by a known bug in the jdk with gradients. The language is JavaFX Script. It is the language JavaFX used to be in prior to version 2. You can run with with JavaFX 1.3 or it should be very simple to port to JavaFX 2. You just need to map the setting of properties to Java set…() method calls. I think there were some conversion tools around on the web as well.